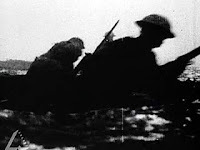 ... 1916 (95 years ago today), Britain began conscripting men between 18 and 41 years of age to fight in the conflict that it had entered nearly 2 years earlier. A million persons already had volunteered, but more were needed due to heavy losses. (The July 1916 Battle of the Somme would claim 20,000 British lives on the 1st day alone.) By the time World War I ended, more than "4.5 million Britons served in arms (in addition to over three million troops from the British Empire)." Many in the latter group arrived only after significant resistance in their home countries, as described, e.g., here (photo credit) and here.